Today, I welcome Gav Thorpe to Names: A New Perspective. Tabletop war games designer and author of numerous tie-in fiction novels, as well as a trilogy of original work, Gav is one of my favourite authors and he has penned some of the best novels I’ve read, one of which I consider to be a Warhammer 40,000 classic: Angels of Darkness. 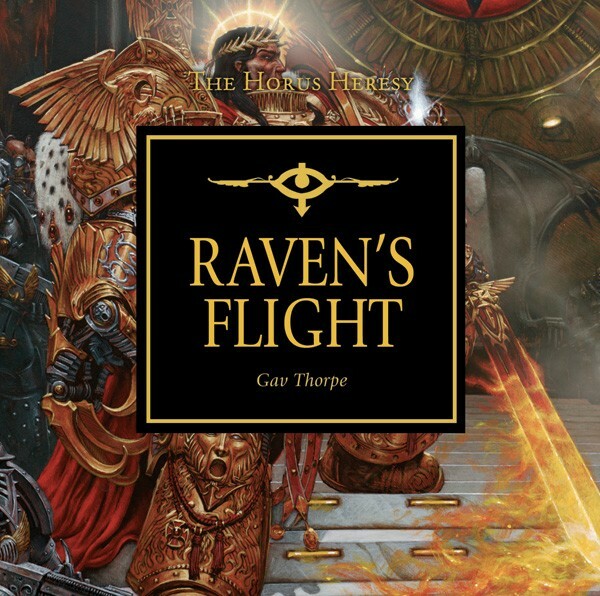 And he has penned one of the best Horus Heresy audio dramas as well, one that cemented my love and fascination with the Raven Guard and their Primarch Corax: The Raven’s Flight (review). His original work for Angry Robot Books, a sandals and sorcery tale that begins with Crown of the Blood (review) was a stand-out read for me last year, and I’m eager to progress with the series this year. Here’s what Gav has to say about the topic of names. Names of characters, places and things provide a bridge between the reader and the world of fiction. In real life we use names as part of a first impression (or only impression on many occasions) making all kinds of assumptions about the bearer; their class, race, and sometimes even profession. We bring our own views and politics to names – an Algernon or Esmerelda is very different to a Dave or Sarah. These assumptions are shorthand, and in writing shorthand can be very useful. Which is all well and good if we are writing in the real world, or some analogue of it where such characters and their backgrounds are going to probably equate somewhat to their counterparts in our existence. When we create a science fiction or fantasy world, all bets are off. Where do we find the shorthand that allows a reader to equate particular characters or subsets of characters to specific cultural values? With consistency and thoughtfulness. All too often fantasy names (and sci-fi too) might just well be a random conglomeration of syllables thrown together to appear exotic. In our world, names have meanings and origins, have a shape and texture that allows us to identify them broadly, if not specifically. There is little confusion between Michael and Rajesh and Xin. Our fictional worlds need to have a similar structure to them, where a reader can see, or at least sense, a commonality between names of similar origin and differences between those that come from different places or societies. In this regard, the sound and shape of names can help just as much as hard and fast rules. Those sounds and shapes can draw upon the real world to bring along rough shorthand, even if there are not direct parallels. A name might sound oriental or Arabic or Latinate and convey any associated imagery and values. When I started creating The Crown of the Blood, I did not want to get hung up on names early on. I wanted to get stuck into the story and writing style. I only had some vague ideas about the sorts of names I wanted to use. In fact, the first solid piece of ‘worldbuilding’ (hate that term, but that’s another thing) was the name of the main character, Ullsaard. From the earliest notes and drafts, he has been called Ullsaard. I like the name. It is a strong name. The name conjures up slightly Nordic, gruff, no-nonsense images that shaped the character. Other names were thrown in pretty much as placeholders. These early names had a more exotic, pseudo-Arab feel to them but with hints of the bronze age Mediterranean world that I was conjuring in my head: Matera; Versunia; Atropia; Asqor; Kariq; Mutaarr; Luia; Asuhas; Cosuas; Kulrua; Muu-attan*; Versunia; Kumaud; Masstrin. *Hyphens, like whimsical apostrophes, should be employed only with care, and even then probably get rid of them anyway. Once I had a good chunk of the opening section written, and was gathering feedback, I took a step back and had a look at the names I had come up with, some of which had changed from those first stabs. The first big change was to get rid of all of those awkward ‘q’s. Not only did they move the names too far away from the anglo norm that most readers would be used to, they were unclear in themselves – were they like a Chinese q or an Arabic q? Best to anglicise, which is how we ended up with Askh, Askhos and Askhor. I had been aiming for a certain style that hinted at a common ancestral language, which had deviated over the centuries. I like to think of the languages of the Askhan empire as being equivalent to the romance languages of Europe, stemming from a shared origin but localised over the years. To give some sense of shape to these names I looked at where the characters and places were in relation to Askh, at the centre of the empire, and how old they were. I came up with a chart that helped codify the names, and looking at them in this context I made a few tweaks and adjustments that helped create sub-groups within the greater whole. This seems like a terribly organised thing to do as a carefree creative, but discipline isn’t just about hitting your word count every day, it is also about attention to details. This is what I ended up with. Names in italics are places rather than people. The other important thing to bear in mind as I came up with more names was to occasionally break the guidelines, particularly in the more cosmopolitan parts of the Empire where peoples from different ancestry would mix. I did not come up with hard and fast rules on this – who has the time? – but just a little effort can pay dividends. More often than not this extra work might go entirely unnoticed by the readership, but you can bet that if you don’t do it, if your names look like they were grabbed at random out of a bag, the readers will notice its absence. Gav Thorpe on Twitter, Facebook, and Web. The next guest is author and friend Matt Forbeck, on the 21st February. You can check out the full schedule in the link up top. Posted on February 18, 2013, in Debut Authors Guest Series, Guest Posts and tagged Angry Robot, Angry Robot Books, Black Library, Corax, Crown of the Blood, Debut Authors Guest Series, Gav Thorpe, Guest Posts, Names, Names A New Perspective, Raven Guard, Sandals and Sorcery, The meaning of Names, The Raven's Flight, Warhammer, Warhammer 40k, Warhammer Fantasy. Bookmark the permalink. 1 Comment.